This article was printed exactly 10 years ago today. Lee Evans set a World Record in the 400 meters at the 1968 Olympics in Mexico City. He has since coached world-class track teams around the world, from Nigeria to Saudi Arabia and currently is the track and cross-country coach at South Alabama University. Yet Evans is perhaps best known for being a founding member of OPHR, the Olympic Project for Human Rights. 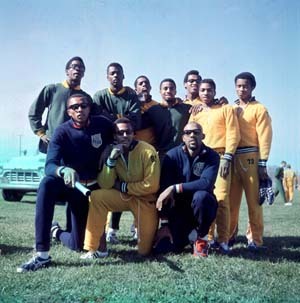 OPHR attempted to organize a boycott by African-American athletes of the ’68 Olympics to protest racism and oppression both at home and abroad. This protest was punctuated with Tommy Smith and John Carlos’s famous raised fist salute after finishing first and third in the 200 meters. DAVE ZIRIN: Please speak about the circumstances in which you grew up. Lee Evans: Well, both of my parents were from Louisiana and they left by train in 1946 to California. They were part of the migration by African Americans right after the war. My dad was looking for work having been a sharecropper in Louisiana. I was born in February 1947 in Madera, California. My dad got work on construction sites. He labored building the big dams in California. On some of the big projects, I’d remember he’d be gone for weeks at a time. I was the middle child. It was seven of us total. I had two older brothers and an older sister and two younger brothers and a younger sister, so I was right in the middle. My mother used to take us out to the fields to help pick whatever was ready to be harvested. I grew up picking cotton and cutting grapes, and we did that from sun up to sun down. That’s how I always thought I got my special endurance. Tommie Smith, of course, grew up in similar circumstances, just twenty miles from me. Tommie likes to tell people we met in the grape patch. We did farm labor work, while my dad did cement work. After I grew up we moved to Fresno, California, which is just twenty miles from Madera. Eventually my mother’s parents also came to California but not my dads parents. He had his mother, brothers and sisters in the south, and we grew up never meeting them. We used to say to my dad, ‘lets go visit your family in Louisiana’ and he wouldn’t go down there. He said, ‘They got Jim Crow down there. I don’t want to go back down there.’ I had no idea what Jim Crow meant. That’s how young I was. I didn’t realize what it was until high school. I came across the word Jim Crow in a history book and then I found out it was segregation. So my dad didn’t go back South until I was a sophomore in college. DZ: What began to radicalize you in the 1960?s? LE: In 1966 I was number one in the world in the 400 meters as a freshman in college. I went to London for a meet and I met these African people and they said we’re going to a meeting tonight, do you want to come with us? I said sure. So they came and got me at the hotel and it was a South African resistance meeting. They said a prayer for the brothers who had fallen during the week and I didn’t even know there was a war going on down there. I met Dennis Brutus there and Sam Ramsamy, who is now president of the South African Olympic Committee. So I met these guys and I really became aware. But I didn’t speak out until the fall of 1967 when no one would rent us housing close to the university. At that time the only black males on the campus were athletes: basketball, football, or track. Harry Edwards was working on his doctorate and he was around. He got wind about our complaints and called a meeting. This is how it started. We started the Olympic Project for Human Rights. And all this came out of us not finding housing close enough to the university. DZ: What was the Olympic Project for Human Rights? LE: The Olympic Project for Human Rights was a vehicle for a proposed boycott by African-American athletes of the 1968 Olympic games. We were very unhappy with the way things were run in our sport. We had ten demands. One of them simply was that we could have a black coach for the team. DZ: Another was about restoring Muhammad Ali’s title. Why was that so important? LE: He was being beaten down by the system the way we felt beaten down all the time so all of us could identify with him. DZ: What’s it about Ali that was so threatening, you think, to the powers that be? LE: His independence and the way he ran his mouth. In those days the black Muslims said that white people were devils and all that stuff so you know that scared white people to death. Also Malcolm X recruited Muhammad Ali to Islam and they were after Malcolm at this time. DZ: The boycott didn’t take hold among the athletes. Was that a successful strategy in retrospect to pursue? LE: Yes. Harry was media savvy. He said all year that we were going to take a vote at the Olympic trials and all year there was commentary in all the newspapers. Some editors made fools of themselves. They would write, ‘Look at these narrow, stupid black guys. They don’t know what they’re doing’. They just said things that exposed themselves to who they really were. The athletes of course voted down the boycott. I was hoping it was going to be voted down because I wanted to run in the Olympics. I knew that this would happen, that the proposal was a way for us to get leverage. Tom and I had talked about it and I said let’s say we’re going to boycott so we can get some things done but we all knew that we were going to run in Mexico. Push comes to shove we were going to be there. DZ: Can you speak about what was accomplished by the Olympic Project for Human Rights? LE: The Olympic Project for Human Rights got a lot of things accomplished that continues today. We brought a lot of awareness to a lot of people. First of all, the fact that some black university students were standing up to the world. Sports columnists hated us. They just wrote horrible stuff about Tommy and myself and so this made the black community gather themselves on our side. DZ: 1936 gold medallist and track legend Jesse Owens was asked by Avery Brundage [the head of the US Olympic Committee] to meet with you in Mexico City. What was his take on your desire to use the Olympics as a platform to raise grievances? LE: Jesse was confused as far as I’m concerned. The USOC dogged him and he knew they dogged him. DZ: What do you mean they dogged him? LE: Treating him badly after his exploits in the Olympic games, when he ran [winning four gold medals in Berlin.]. He came back, didn’t have a job, racing horses for money, We were really annoyed with him because he knew what we were going through yet he pretended that it didn’t exist and that just blew our mind when he called a meeting with us in Mexico City. I thought he called this meeting because Avery Brundage sent him there. Jesse Owens was sitting on the fifty-yard line with all the important people of the world, the royalties, the Avery Brundages. They have a special section where they sit in the games right at the fifty-yard line and Jesse, that’s where he was sitting. He thought he was one of them. He had forgot that he was once an athlete struggling like we were. So he came and talked to us like he was Avery Brundage or the King of England or somebody and really talking stupid to us and we just shouted him out of the room. And then out of the blue he said, "You know wearing those long black socks [running socks that were an act of identification with the Black Freedom Struggle] are going to cut off the circulation in your legs." That’s what he told us. We said this guy is really out of his mind! This is when we ran him out of there. I still admire him to this day, that’s why I say he was confused coming to talk to us like that because we knew that he was being victimized. He was a victim and we felt sorry for him actually. DZ: What was your initial reaction in your heart when you saw Tommy Smith and John Carlos raise their black-gloved fists on the medal stand? LE: I said that’s a good idea, I was also thinking about what Avery Brundage would do to them. Brundage was asked about the black athletes–about what would he do if we protested at the games. He said, ‘We would send those boys right home. They should be lucky we allow them to be on the team. He never should have said that because we started having meetings again after that and we said we are going to have a protest at the Olympic games. We never could come to a uniform protest. There was always a disagreement, ‘I can’t wear black socks,’ ‘I can’t wear black on black,’ ‘I can’t do this, I can’t do that.’ We finally agreed that if you make it to the victory stand get together with another black guy you’re with and do the same thing. We were going to protest by event, in other words. In the 400 meters, we had decided we were going to wear black berets, that’s what we did. Tommy on the other hand had gloves in his bag because we thought Avery Brundage presented the gold medals to everybody. So I told Tommy, ‘I don’t want to shake Avery Brundage’s hand. Lets get some black gloves and stick them in our pants and before Avery Brundage shakes our hand, we’ll put the black glove on and wait until he has a heart attack. So I had two black gloves in my bag also. But as we found out later, Avery Brundage didn’t give the gold medal out to everybody and they kind of shifted around with the different dignitaries. But Tommy, when he was waiting to go outside to run, gave one of the gloves to Carlos. He took the other glove and they did their thing and I didn’t see anything wrong with it. DZ: What was your reaction when you heard that they were stripped of their medals and sent home? I read reports of you being very, very upset. LE: Oh yeah I was because they were my teammates. I was very distraught. I wanted to go home. I said I wasn’t going to run. But Tommy and John–they came to me and said I better run and I better win. They came to my room and that freed my mind up to go run because I was confused, but when they told me that I should run that really freed me up. DZ: You mentioned that you wore a black beret on the stand? LE: That was our protest. After what Tommy and John did, what anybody else did was like little or nothing. DZ: When the media asked you why you wore a black beret, you said sarcastically that it was because it was raining. LE: Yeah but they knew why. We knew that the black beret was a symbol of the Black Panther Party. DZ: What did you think of the Black Panthers at the time? LE: I thought they were pretty brave guys but I wouldn’t do what they were doing. They were having a shoot out with the police almost every day. So my job [protesting at the Olympics] was easy. This is one of the things I learned from Malcolm X and Martin Luther King. Everybody can play a part but everyone has to do something. I used to say to guys I was trying to get to come to meetings. I said, ‘it’s going to be easy for us. We’re just going to be the Olympic games. I know some guys in Oakland shooting out with the police. So what we’re doing is nothing compared to those guys. We’re not putting our life on the line.’ But as it turned out we did put our lives on the line because I had maybe 20 death threats on my life in Mexico City. You have mailboxes in the Olympics. I had the KKK, the NRA, saying ‘Yeah we’re going to shoot you niggers.’ They even tell you what time they’re going to shoot you. DZ: What kind of reaction did you get? LE: I had a tough time too because the blacks thought that I didn’t do enough and the whites were just mad. I got it from both sides. The black people thought I should have done nothing less than dynamite the victory stand. That’s the only thing that would have satisfied them because after Tommy and John, what else could I do? DZ: You’ve done some unbelievably amazing things since those days in ’68. Can you just say something about what you’ve been doing since then in terms of coaching in Nigeria and Qatar and Saudi Arabia? LE: I remember as soon as I learned about why I was black and why I was in this classroom in Fresno, California as a youngster–that my heritage and my people were ex-slaves and they came from Africa. As soon as I learned about what Jim Crow meant and I found out that my ancestors were Africans, I wanted to go back to Africa. So that’s what I did. I went back to Africa in 1975 and I worked there for about twenty years and I was fortunate to coach three Olympic medal winners on Nigeria’s team. DZ: You also coached in Qatar and Saudi Arabia? LE: Yes, I was an international coach and when I turned 50, I told my wife, we have to go back to the U.S. because I don’t have any retirement. So I’m in the U.S. trying to get some retirement and after I get some retirement that means I have to stay here ten years, I’m going to go back to Africa and continue my work over there. DZ: And now you’re a coach at South Alabama. LE: Yea, I’ve got seven more years. DZ: Because you have that experience in Africa and in the Middle East, I want to ask you, what do you think about Bush’s policies over there, the war on terrorism? LE: I don’t agree with the war in Iraq. You know, I’ve been to all those places and Iraq never had any designs on the U.S., I can tell you that right now and I think that all these right wing Republicans know that. They just want a war so they can do their money-making thing. That’s the only reason I can think of. I agree with going after him but what they’re doing in Iraq, and to the Arabs is stupid. That’s why the Arab countries are against it because they knew that Iraq was no threat to the U.S. and Saddam wasn’t either. They have no weapons of mass destruction. DZ: Last question: you guys brought the black freedom struggle into sports. Do you think that needs to happen again? LE: Yeah, these guys should be aware, but they aren’t unfortunately. It’s more about money for them. I think money is polluting their mind. They’re not conscious of what’s going on, they don’t care about other people. That is going to have to change if we are to move forward. DAVE ZIRIN is the News Editor of the Prince George’s Post in Prince George’s County Maryland. He can be reached at [email protected]. His sports writing can be read at www.edgeofsports.com.